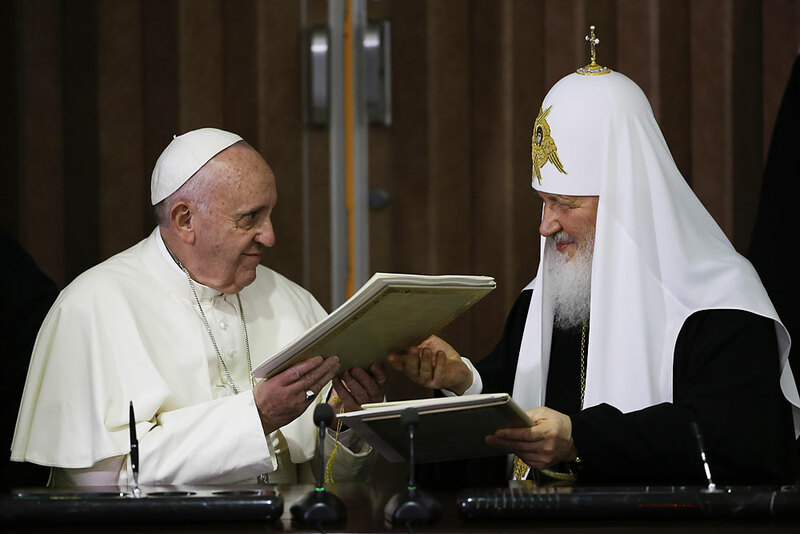 Pope Francis, left, and Russian Orthodox Patriarch Kirill exchange a joint declaration on religious unity in Havana, Cuba, 12, February 2016. Pope Francis and the leader of the Russian Orthodox Church, Patriarch Kirill, held a historic meeting in Havana's international airport. The two leaders signed a memorandum, which focused on ecumenism, or efforts to reunite Christian churches, common Christian values, and the persecution of Christians in the Middle East and Africa. The recent meeting in Cuba between Patriarch Kirill and Pope Francis has resulted in the heads of the Russian Orthodox and Catholic churches signing a declaration on protecting Christians from persecution in the Middle East and North Africa. Following their historic meeting in Havana on Feb. 12, Patriarch Kirill and Pope Francis have signed a declaration on protecting Christians from persecution in the Middle East and North Africa. In addition to stating this goal shared by the two churches, the declaration also touches upon the issue of traditional family values. The document also contains individual sections on the civil war in Syria, the conflict in Ukraine and the refugee crisis. The signing of the declaration took place under an icon of Our Lady of Kazan, one of the most revered in the Russian Orthodox Church. The text of the document had been agreed in advance. "We spent two hours in an open, brotherly discussion," Patriarch Kirill said after the signing ceremony. "In full understanding of our responsibility for our Churches, for our believers, for the future of Christianity and the future of human civilization. It was a very substantive discussion that gave us an opportunity to understand and to feel each other's positions." The Patriarch went on to stress that "the outcomes of this discussion allow one to say that the two Churches can protect Christians all over the world and with full responsibility work together to prevent wars and to make sure that human life is respected everywhere. So that human morality is strengthened and so that, through the church's participation in the life of modern society, the sacred name of the Father, the Son and the Holy Spirit is glorified." "We spoke like brothers," Pope Francis said after the meeting, "because we are bishops, we have Christian faith and we sought a similar path."